Obscurae: What got you interested in doing hair? Nicolas Jurnjack: I'd have to say serendipity. I was bored at school, I left early and as a young teenager it was mandatory to enter a training program. I was given a choice of four options; apprentice hairdresser was one of them. At the time I was focused on the pocket money it would afford me, and, being a teenager the constant interaction with girls; the relaxed nature of a salon and being close to the beach was what appealed to me. But, I found myself drawn to hair it came alive for me. I started taking notice and I found I had an affinity with hair, it responded to me as I responded to it. I saw my horizons expanding. Hair offered me a freedom I had not considered and unlimited ways to develop, discover and express myself. What made you want to approach hair in a fashion sense? In the late 80s and early 90s, when I started out, the fashion world was an explosion of creativity, everything was permitted, boundaries were there to push against, "dare to dream and do it" was the mantra, whether in styling, photography, makeup, hair, design – fashion shows were a celebration of art, imagination, wild and wonderful, awesome, aspirational spectacles. The focus was on exploring the unexplored, rediscovering the forgotten, reinterpreting the past for the present and envisioning the future, it was a time of great experimentation and vision using unprecedented fields of colors, shapes and volumes. It was a golden time and being creative was a passport to making a name. Did you see yourself being published by Vogue and Harper's Bazaar? To be honest it was a bit off my radar. I was raised in Marseille in the heart of the quartiers nords, the exit strategy was through football and sports, my childhood dream was to be a tennis professional, I love tennis. But, when I had no choice but to apprentice at a hair salon I discovered inspiration and an exit in the fashion magazines that lay around. Annoyed at my boss I shouted at him "you'll see, it will be my hairstyle, my name of those covers one day, I'll send you a copy! That show of bravado was the first time it registered in me as a possibility, a goal. What did you need to do to get published by them, or did they approach you? I knew I would have to be plus one hundred percent prepared to deliver when a call came my way – there are few if any second chances. I realized that being technically proficient was not enough to take me where I wanted to go I needed to be so much more than that. I started by doing test shoots, year in and year out, I used them to build my portfolio and gain experience. I honed my skills. I practiced in my basement with plastic heads. I experimented. I tested myself – open a magazine at random, do that hairstyle, add my touches and push myself as far as I could. I went to the library as often as I could to research hair: the culture, the history, the politics and current trends, fashion through the ages and across the globe. I immersed myself in a world of visuals: nature, architecture, art, film, and explored all kinds of music, music has always been an inspiration to me. I made it a point to regularly visit and revisit agencies and magazines to show my portfolio, my latest work, leave my card – for a long time I remained "that kid from Marseille." One day, for the umpteenth time, I left my number at the Vogue Paris reception desk telling myself, "this time it will work, this time I will get a call". And then a cover shoot for Vogue was re-scheduled for August because of rain. In August Paris is empty, all the session stylists were out of town or booked – except for me! Someone at the Vogue reception desk had kept my number. Vogue Paris called me! It was what I had been preparing myself for years and since that day I have worked and still work for Vogues around the world. 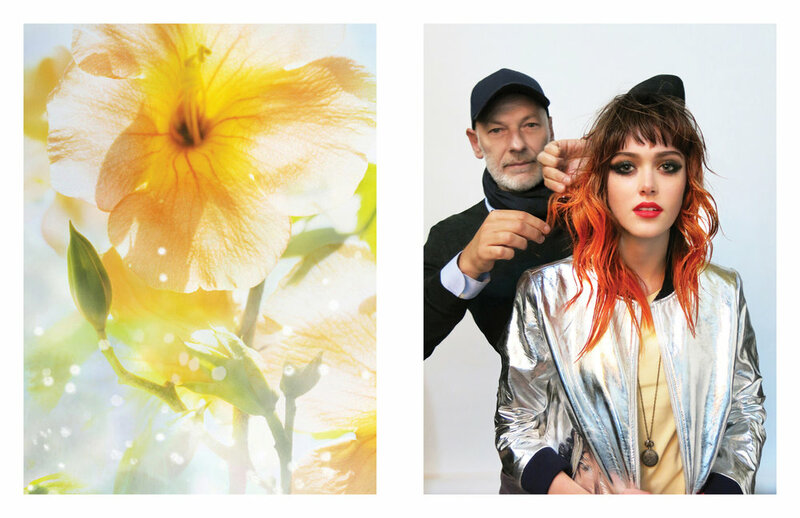 What inspires the hairstyles you do? Light, shadow, nature, color, shapes, forms ... The play of wind in autumn leaves. Architecture. Music ... I'm naturally observant and curious. Everything I see lodges in my head, sometimes without me taking conscious note of it, and weeks later it surprises me presenting itself as a fully formed idea, sometimes it is released by music, a sound or a word – I can't explain it. "This morning, walking through Paris, I remember a store window – the pink of a bag in vinyl for a little girl and the brown-brown colour of a vase not really fitting to form, a little unusual. That will serve me for later. Or not. For what I have no idea. But it remained with me. I note. I accumulate. I fill my store with ideas, my little market of sensations and perhaps something will resurface unexpectedly for a show or an editorial. These lucky finds feed me. The chance encounter smiles at me. " Excerpt from"In The Hair"
Do you always do fashion inspired hairstyles or do you hairstyles for the everyday person as well? I am equally inspired by creating styles and haircuts for everyday wear as I am by designing fantastic otherworldly creations. To succeed – everyday hair, haute coiffure, and everything in between demand skill, talent and imagination, no two styles or cuts are the same, just as no two people are the same. To develop a vision and a lasting career in the fashion industry a hairstylist has to be able to travel from the simple to the sophisticated and beyond and back again. We creatives in the fashion industry build and develop our profiles by working with high-end glossy magazines and doing fashion shows and hair specials in magazines, it gives us the opportunity to showcase our range, technical skills, imagination and to develop our signature. The goal is to be approached for a consultant position for a hair brand, develop a business, a line of products, education ... This is a type of payback because magazine work and fashion shows are about the prestige not the pay. If you concentrate solely on one or the other end of the spectrum your window of visibility narrows and it can limit your career. What specific training did you go through to be the hair stylist you are today? In the beginning, I had my apprentice experience and some mandatory classes that came with it, along with my own research about hair and products. But, it took me a while to build my confidence, I didn't have anyone to bounce ideas off or offer feedback or confirm the path I was on. To counter this feeling I devised my own training, one of adventure and discovery, experimentation, trial and error and practice, practice, practice. It proved a useful discipline and I still use the same lessons to this day. A concept will develop in my mind and I wonder, "how am I going to do that, how am I going to make that work as a hairstyle"? After thirty years of being in the business I still have ideas for hairstyles that demand my full attention and challenge me. It's still an amazing journey of discovery for me, and I am still joyfully surprised by how much more there is to learn. Did you have a mentor or someone you looked up too? There were hairstylists in fashion whose work I admired and naturally the greats in the history of hair. I arrived in Paris as a teenager not knowing anyone. I balked at being an assistant – what I frequently saw around me as being merely"a fetcher of bags." Where I came from resourcefulness is king and becoming a lackey the worst of all humiliations. Even today I carry my own bags. There is no question of me turning my assistants into grooms and baggage handlers. I do remember a pioneer art director, Peter Knapp, a legend. I met him with my portfolio of tests. I remember his words, his encouragement, he said, "your work is remarkable", he asked me to create an avant-garde hairstyle for the cover of a popular culture magazine at that time. I was overjoyed. How long have you worked with Vogue and Harper's Bazaar? It's been awhile now, thirty years and still going strong. Broadly speaking it's about nurturing a passion navigating a route to success – the highs and lows, the tough, the funny, the crazy, and the joys of living a life of creativity and aspiration. 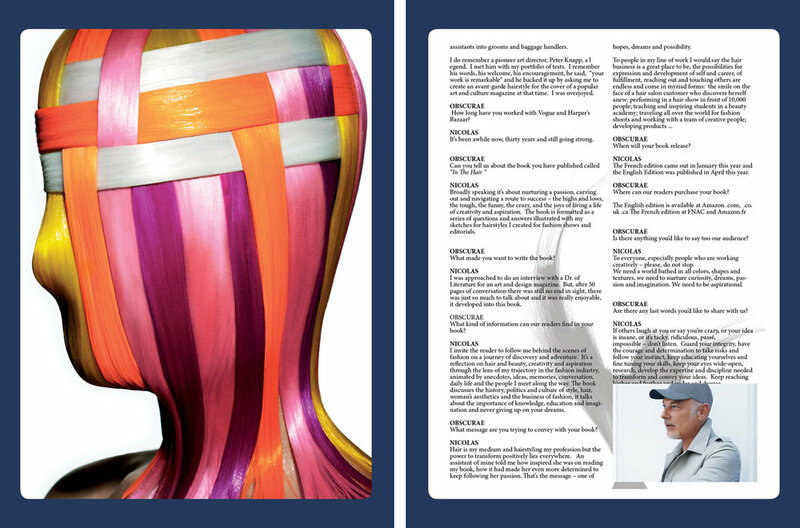 The book is formatted as a series of questions and answers illustrated with sketches for hairstyles I created for fashion shows and editorials. What made you want to write the book? I was approached to do an interview with a Dr. of Literature for an art and design magazine. But, after 50 pages of conversation there was still no end in sight, there was just so much to talk about and it was really enjoyable, it developed into this book. What kind of information can our readers find in your book? I invite the reader to follow me behind the scenes of fashion on a journey of discovery and adventure. It's a reflection on hair and beauty, creativity and aspiration through the lens of my trajectory in the fashion industry, animated by anecdotes, ideas, memories, conversation, daily life and the people I meet along the way. The book discusses the history, politics and culture of style, hair, woman's aesthetics and the business of fashion, it talks about the importance of knowledge, education and imagination and never giving up on your dreams. What message are you trying to convey with your book? Hair is my medium and hairstyling my profession but the power to transform positively lies everywhere. An assistant of mine told me how inspired she was on reading my book, how it had made her even more determined to keep following her passion. That's the message – ­one of hopes, dreams and possibility. When will your book release? The French edition came out in January this year and the English Edition was published in April this year. Where can our readers purchase your book? Is there anything you'd like to say too our audience? To everyone, especially people who are working creatively – please, do not stop. We need a world bathed in all colors, shapes and textures, we need to nurture curiosity, dreams, passion and imagination. We need to be aspirational. Are there any last words you'd like to share with us? If others laugh at you or say you're crazy, or your idea is insane, or it's tacky, ridiculous, passé, impossible – don't listen. Guard your integrity, have the courage and determination to take risks and follow your instinct, keep educating yourselves and fine tuning your skills, keep your eyes wide-open, research, develop the expertise and discipline needed to transform and convey your ideas. Keep reaching higher and further and wider and deeper.